It's hard to avoid logging screen time of some kind on a daily basis, and that's true even in young children. Babies in the U.S. start watching TV early on, with educational DVDs and television shows designed to encourage early language development in pre-preschoolers. The question is, Do instructional DVDs actually help babies learn? To find out, researchers at the University of California at Riverside designed the most definitive study of the issue to date. The study used a DVD called Baby Wordsworth (part of the Baby Einstein series), which is aimed at teaching babies new vocabulary words, and assigned a group of 12-to-24-month-olds to watch it daily for six weeks. Turns out, the videos didn't work. There was no difference in language acquisition between children who were assigned to watch the DVD and a control group. The results, published on Monday in the Archives of Pediatrics & Adolescent Medicine, are in line with several other studies. In fact, past analyses have found that infants who watch educational DVDs learn fewer words and score lower on certain cognitive tests by the time they reach preschool than kids who haven't watched the videos. These studies, however, were all observational  meaning that rather than assigning babies to watch videos or avoid them, scientists simply asked parents about their babies' viewing habits and then correlated that information with the kids' performance on tests of word acquisition and language skills later on. This time, psychologist Rebekah Richert and her team did those studies one better. She randomly assigned two groups of babies to either a Baby Wordsworth or control group, then carefully tracked how many of the 30 target words highlighted in the video the babies were able to learn. The words were those that children would commonly hear around the house, such as table, ball, piano, fridge and chair. Parents were asked to evaluate how many of these words their babies understood and how many they could speak, while toddlers were tested separately for their recognition of pictures associated with the target words. Each of the 96 infants and their parents were followed for six weeks, and were evaluated four times in that period. While all the kids added new words to their vocabulary over the course of the study, watching Baby Wordsworth had no added benefit. "We found that over the course of six weeks, the children watching the DVDs didn't learn any more words than children not watching," says Richert. Dr. Dimitri Christakis, a professor of pediatrics at the University of Washington in Seattle, whose studies were the first to dispute the claim that educational DVDs improve babies' language skills, noted the importance of Richert's findings in advancing our understanding of how babies learn  or, in this case, don't learn  language. "The novel thing here is that this is actually the first experiment in the real world using these products to robustly test their claims," he says. Another reason videos inhibit word-learning may simply be that they replace precious parent-child time that could be spent learning the same words. If babies are watching a DVD, they are not engaging or communicating with their parents. In Richert's study, her team found that the most learning occurred when parents directly taught children new words by pointing at an object, saying its name and repeating it. In the final session in the lab, the researchers observed parents and their youngsters as they watched Baby Wordsworth together; the children's ability to learn words in these situations was enhanced. "What we are finding in our study is that the DVD itself is not a substitute for that kind of live social interaction," says Richert. "For children under the age of 2, social interaction is key to their ability to learning something like words." 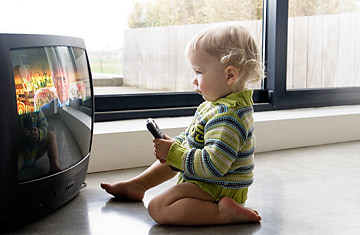 Based on the evidence, the American Academy of Pediatrics has recommended for several years that toddlers under age 2 not watch videos or television, and Richert's findings support that advice. But she notes that it's not an all-or-nothing situation. "Given that media is becoming a consistent aspect of children's environment, there are ways that parents can use these DVDs," she says. "They can use them to sometimes teach children, but they should be aware that without being involved themselves, children aren't likely to learn." As enticing as new technologies may be in improving children's development, there is no substitute for a parent's attention and time.